You play as one of five heroes from the various races of the Warhammer world, and must work together with 3 others to maim, slaughter, incinerate, smash, explode and just generally massacre your way through a flood of various classes of Skaven (a humanoid rat like race who worship a minor Chaos god) who are intent on burning everything to the ground. The game itself plays very much like Valves Left4Dead series, and even has a similar HUD layout to it, which personally I think is perfect, as it keeps the minimal HUD aesthetic while at the same time letting me see what my team mates are carrying and what their health is. I can safely say though that it takes the L4D recipe and spices it up quite nicely in several ways. 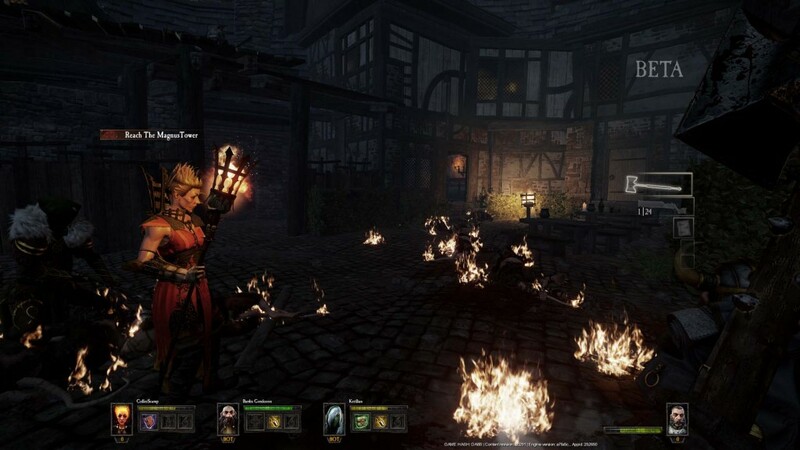 To start with, combat is much more melee focussed, and melee combat feels heavy and visceral. 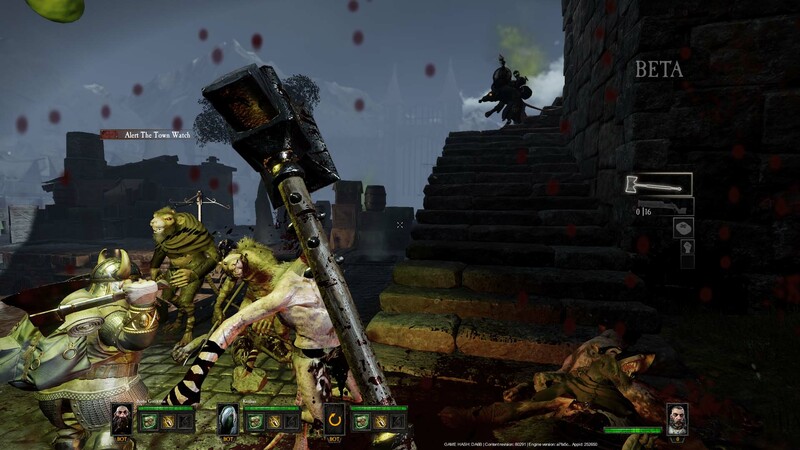 Axes and swords make a satisfying squelch sound when they lop off a rat man’s head, and there’s a lot of detail being paid to the attack animations to help add to that hefty feeling. The small delay when you pull your weapon out of the next of your last enemy before turning and smashing the next one in the face really adds to the weight of the weapon. In my short play through I tried both the Dwarf Ranger, who uses a small hand axe and a shield as his primary weapons plus a crossbow for a ranged weapon, and the Empire Soldier, who has a great hammer (one of the most satisfying weapons I got to use) and a blunderbuss that is more akin to a small cannon than anything else. Both characters felt different and had varied playstyles. As the Dwarf I spent a lot of my time at the front trying to gather all the rat men around me while blocking and pushing them back with my shield in order for Kris (our Bright Wizard) to annihilate them all with a well-placed fireball. While as the Soldier I would just get stuck into the melee, swinging my hammer about like a man possessed and then swapping to the blunderbuss when they started to overwhelm me. 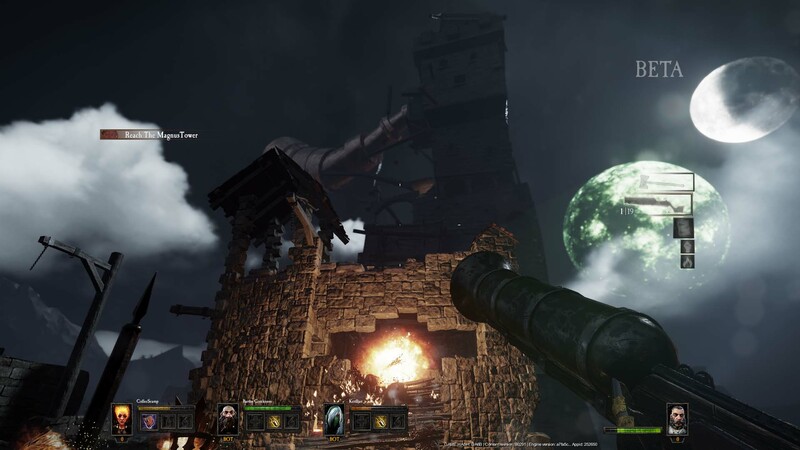 Its worth mentioning that the beta had some rather serious sound bugs that gave me caused for concern, however I got in contact with the feedback/bug report guys at Fatshark, who advised they are aware of the issues and they are being worked on, so fingers crossed those issues will be sorted before release! This entry was posted on Wednesday, September 30th, 2015 at 8:00 am by Jason and is filed under Blog. You can follow any responses to this entry through the RSS 2.0 feed. You can leave a response, or trackback from your own site.